In Pano2VR, you can create or add a skin to your HTML5 and Flash outputs. A skin, as a whole, is a graphical element (interface) that is layered over the panorama and can include images, buttons and sounds. For example, a controller skin includes graphical elements (buttons) that allow you to control the panorama. The Skin Editor has 4 main sections: the Tree, the Editor, Properties and the Toolbar. The Canvas is where you build and design the skin - it’s your workspace. The toolbar and menu bar also contain tools. Go to Tools → Skin Editor in the Menubar. Click the Skin Editor button in the Toolbar. Click the Skin Editor button in the HTML5 or Flash output panel. Above this button, you can choose from a selection of built-in skins. Make sure no elements are selected. 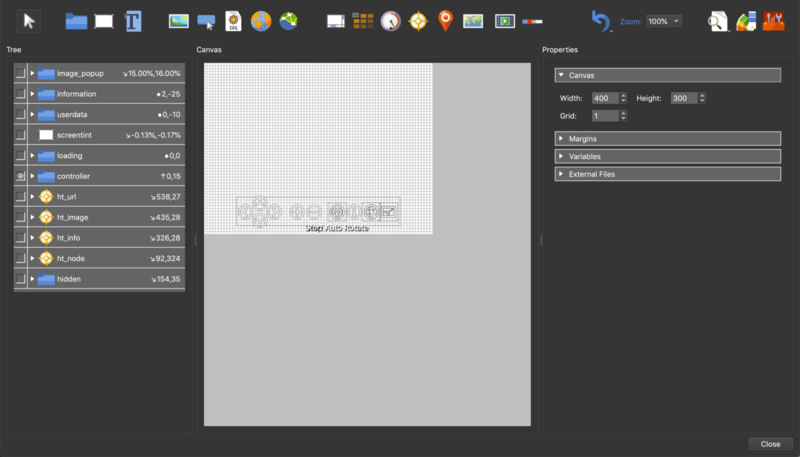 In the Properties section, Canvas panel, choose the size of the canvas and change the grid size. Zoom in to the canvas using the Zoom control in the Toolbar. Add elements to the skin. These can be buttons, images, SWFs, SVGs, sounds, videos or external elements. Go to the Toolbar and select any element, then click in the Canvas to add. Go to the Menubar and choose, Elements. Select an element and then click in the Canvas to add. Drag the elements on to the canvas. Right-click elements in the Tree to cut, copy, paste, lock, align, distribute or create a component from them. Apply actions to elements for user interactivity and control. Select any element and go to the Actions panel in the Properties section. Double-click the empty table row or click the green plus icon. ✭ Tip: To quickly export a project to test the skin, go to the Tools menu and choose, Generate Output. This is only available when the skin is opened via the Output panel. Learn how a skin works and then learn how to customize the built-in skins for your needs. Pano2VR ships with fully functioning skins that you are free to use for your projects. You will find these skins in the Skin menu of the HTML5 and Flash output settings. Add a point hotspots and set its Type to Image. Select the image to pop up. Simplex V5 is the same design as Simplex Skin, but has been updated with the same features as the Silhouette Skin. This is a variation of the Simplex Skin V5. Its controller will hide itself after 5 seconds. Use this skin if you intend to view your panorama with a Google Cardboard Viewer. ✭ Hide the Tree and Properties with the keyboard shortcut, Shift-Alt [win] or Option [macos]-Tab.